How do we master the skill of ‘learning how to learn’? Traditional learning methods, focusing on repetitive learning or learning by rote, often fail to tap the brain’s infinite capacity to learn. These methods slow down reading speeds, comprehension, and creative absorption and application, producing in the learner a lack of interest in the subject. Today, accelerated learning techniques are gaining in popularity among learners of all ages globally. Such techniques help make learning a productive process with a deepening of comprehension, retention, and critical thinking skills. ‘Quantum Excelerated Learning’uses the process of whole-brain learning, enhancing memory and recall exponentially while combining different learning methods that help make learning faster, creative, and more effective. In the process, learning becomes an act of creation. Equally substantive will be the methodologies of learning and the relevance of memory as a tool in an era of machine learning and artificial intelligence, where machines typically ingest unimaginable quantities of data and information to carry out tasks normally performed by human professionals. Say for example, basic document review at a law firm, where machines can scan hundreds of documents to identify what could be relevant to a particular case. This level of work is fast gaining ground in the US, for example. So, will deep cerebral and creative modes of thinking be replaced by machine ‘thinking’, if you will? Will humans need to store or ingest vast troves of information, data, or recall? How does it impact learning and teaching? The 38thRajagiri Round Table looked at transformational learning and the process of strengthening inherent human potential, including aspects of design and delivery of teaching or training. Dr. Giridhar Gopal, Director, Innominds Academy: It was in the 1980's that Colin Rose put together the framework of what he called ‘accelerated learning’, which was a radical break from the traditional rote learning or learning by repetition. In rote learning, all that children did was to sit and receive under a punishment-fear paradigm. There was poor creative absorption and application. So, in accelerated learning, there was a shift from conventional learning to faster learning, using multiple intelligences and videographic memory. It was a belief-changing and reprogramming philosophy. Learning and teaching occur sans judgement even as learning is done the way the brain learns. Importantly, learners learn what they want to learn and learn in context. So, it is a learner-centric philosophy. Wing Commander (Retd) Joseph Paulson, Director, Innominds Academy: Psychometric assessment is a powerful tool for potential estimation and goal setting, especially given the competitive times that our youngsters inhabit today. The tools analyse a student’s interests, personality (under Carl Jung’s matrix of interests), and aptitude and ability. The observations thereof help us reach a holistic assessment of personality and personality type. Two key factors prevent learning: belief and memory overload. The first refers to self-internalised belief systems about one’s capabilities or the lack thereof, which, in turn, becomes not only self-defeating but also a self-fulfilling prophecy of sorts. The second thrusts so much of structured and unstructured information on the young learner for him or her to be able to make a coherent sense out of it. Prof. (Dr.) P. R. Poduval, Former Director, School of Management Studies, CUSAT: What is essentially learning? Is it a series of activities or processes? Learning is in essence the after-effect of learning. In fact, there is no transformative learning, for learning itself is transformation. The question of memory is an important one, but it needn’t necessarily be so for the process of learning. Here process is key. Dr. Raman Menon Unnikrishnan, Former Dean, College of Engineering and Computer Science at California State University, Fullerton: There is no denying the importance of memory as a tool of learning. It becomes more so in a world where the young are tested on aspects of recall and application. In fact, interestingly, it isn’t the ones who have secured very high marks who get an easy entry into top colleges despite comparable scores in GRE and SAT. The ones who have scored top marks needn’t necessarily make the cut at the finishing tape. So, what works? Memory as a tool, certainly yes. But what is critical is how is memory is harnessed. 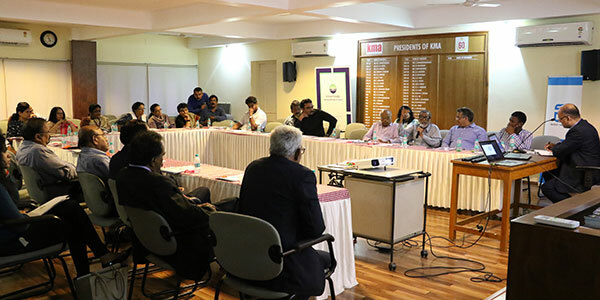 The Round Table discussion was partnered by Innominds Academy, a leading psychometrics testing and career counselling and consulting organisation with a presence in North America, UK, Middle East, and South East Asia. Of particular interest was the ‘belief-breaking’ session conducted by Wg. Cdr. Joesph Paulson, who initiated students into the act of breaking self-fulfilling beliefs that hold them back by encouraging them to successfully carry out tasks that prima facie looked difficult or even impossible.